Need a 3D modeling rendering & graphic designer? Capital Exhibits is here to service all of your graphic design and 3D rendering modeling needs, regardless of your company size or industry. We service Tallahassee, Miami, Jacksonville, Tampa, St. Petersburg, Orlando, and their surrounding areas. Ask about our large format printing on rigid substrates, vinyl, fabric, mesh, static cling and more. Our team of professionals is here to help you increase your brand awareness by offering the best graphic art design services —All within your budget! To make every trade show your company participates in a success you need materials that will catch everyone’s eye. 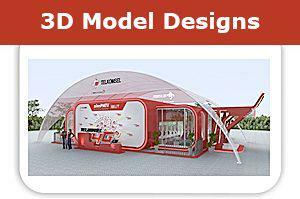 Our 3D modeling designers and print graphic design artists can create quality trade show displays to enhance your company’s success at exhibitions and fairs. We want you to get the best value from our 3D product designs to print graphic design services. For print design pricing, t shirt graphic design prices, and logo design prices visit our graphic design quotes & rates for more info. Choose from a variety of sizes for the displays and choose the perfect combination for your trade show booth. 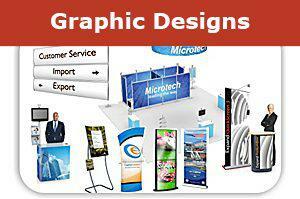 Our banner design artists are some of the best in Florida, so you can trust in their work. Capital Exhibits knows that attracting customers is just the beginning. Your company needs other promotional material for potential buyers to take home and refer to for further information. Our company offers brochure design work and tee shirt design. Take a look at our flyer design portfolio to see that our graphic designers can give you the very best graphic design idea in the state. We also have design services for logos and business cards, all to fit the concept of your company. Our team of experts at Capital Exhibits believes that “We build your best image.” Our graphic design services can increase your sales by improving brand awareness. With our targeted branding design we can use graphics, logos, and promotional material to reach more potential customers for your company. As one of the best graphic design companies in the U.S. we can help your company succeed! Just call (866) 730-3746 or send an email to [email protected] today!